Heading into finals day, Pierce Lehane and Kip Foster had high hopes of managing some sort of result at the IAME International Final, but it was not to be for either. Starting P6 in dry conditions for the Senior X30 pre-final, Lehane dropped a position in the opening corner only to be pushed wide further around the lap and tumbling down the order soon after, scoring a DNF. Now starting off the back for the Final, Pierce got up to about P24 before retiring. Set to start the Masters final from grid 14 (up from P22), Kip Foster didn’t even make the race, missing the parc ferme gate lockout due to an ignition problem (as he explains in the video below). Best placed Australian was Lachlan Robinson, who was racing under a UAE licence. A solid, consistent performer throughout the heats in IAME Junior, Lachlan moved forward in both the pre-final and Final to take an excellent 7th place and setting one of the fastest laps of the race. Matthew McLean (Kosmic, IAME Senior): Q122 of 140 (Group B). H1 – 23rd, H2 – 34th. H3 – 21st. H4 – 25th. H5 – 17th. H6 – 31st. H7 – 28th. Ranking – 110th. Lachlan Robinson (Tony Kart, IAME Junior): Q87 of 110 (Group C). H1 – 10th, H2 – 7th. H3 – 14th. H4 – 10th. H5 – 14th. Ranking – 31st. PreFinal – 21st. FINAL – 7th. Kalen Chin (Kart Republic, IAME Junior): Q88 of 110 (Group D). H1 – 15th. H2 – 17th. H3 – 34th. H4 – 28th. H5 – 25th. H6 – 25th. Ranking – 80th. 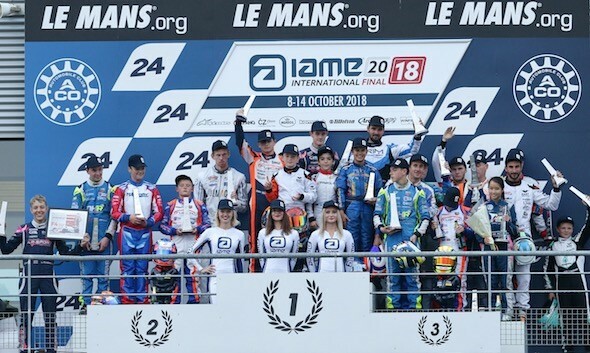 The 7th IAME International Final flawlessly organized in 2018 finished in a blaze of glory with breath-taking, hotly-contested races in front of more than 5000 spectators. Although changeable weather was expected it stayed fine and the track was dry throughout! The 466 drivers put on a thrilling sporting spectacle in qualifying and there was no let-up in the suspense right till the end of the finals in which victory went to three British drivers, an American, a Frenchman and a Dane among the 47 nationalities represented. Congratulations to all the warriors present at Le Mans and the winners Turney, Lloyd, Nielsen, Riche, Bale and Crews. The final was the theatre of a really mind-blowing battle with more than 10 drivers going wheel-to-wheel for victory for several laps. Pre-final winner Harry Thompson did not enjoy the benefits of pole position for long as Nicolas Picot passed him to take the lead in the race. The two drivers then tagged each other, which resulted in a change in the order. Joe Turney, Elliot Harvey, Joey Van Splunteren and Oliver Hodgson (winner in 2017) filled the places at the head of the field until collisions eliminated the last three from the chase for a place on the podium. Clayton Ravenscroft, Charles Tesnière and Thompson took advantage of this to close the gap to Turney. But the latter hung on to his lead and won the race. Ravenscroft ensured a double for Great Britain and the KR Sport team’s Kosmics. Tesnière and Thompson were penalized for detached spoilers, which handed third place on the podium to Siim Leedmaa (Kosmic) from Estonia who finished in front of two more Brits at the wheel of Exprit, Stephen Letts (+24 places) and Louis Westover. While British driver Alex Lloyd (FA Kart) won his pre-final and the final the two races provided thrilling spectacles with positions changing every lap. Both Dutchman Dilano Van’t Hoff (Exprit) and Frenchman Loris Cabirou (Kosmic) climbed up the time sheets in qualifying thanks to a hard-charging drive and got stuck into the battle for victory with Lloyd and Lewis Gilbert (Kosmic), who started ninth! Cabirou led the race for a few minutes. Gilbert thought he had done the hardest part of the job when he crossed the line in first place, but he was hit with a penalty because of his spoiler. Lloyd (Dan Holland Racing) who had been quick all weekend was declared the winner. 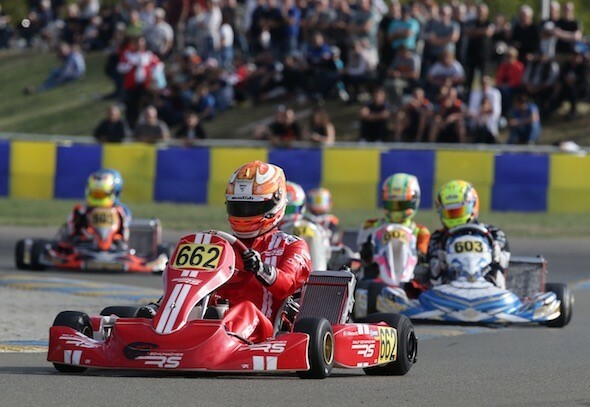 Finally, Cabirou wasn’t among the front-runners and British driver Joshua Rattican (Tony Kart) made a great comeback to clinch second place in front of Van’t Hoff. Rounding out the top 5 was another Briton, Taylor Barnard (KR), and Sam Balota (Exprit) from Belgium. 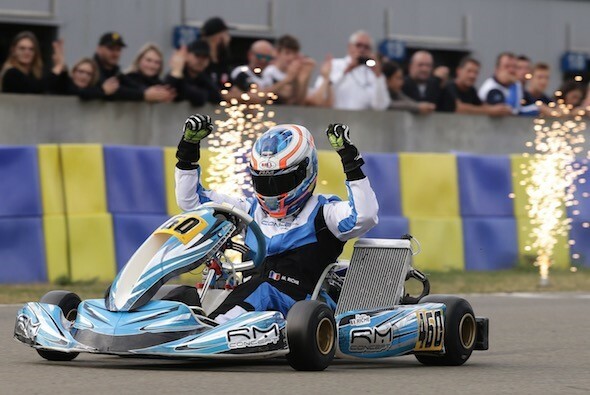 There was a bit of pushing and shoving at the start that cost British racer Callum Bradshaw (CRG), who had dominated the event up till then, and Frenchman Andreas Hebert (Redspeed), who had put on a scintillating performance in the pre-final, several places. Nicklas Nielsen (Praga) shot into the lead with Danny Keirle (KR) in hot pursuit. 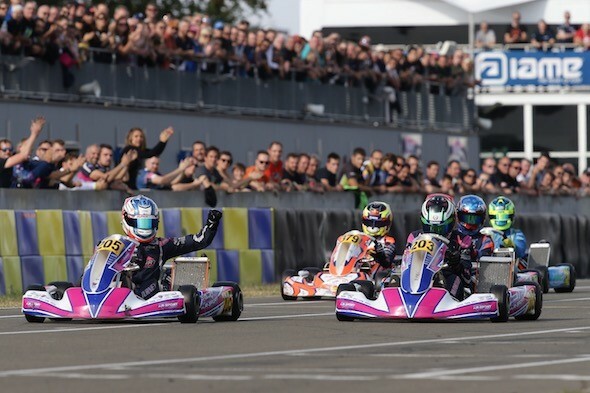 Behind these two five drivers were locked in battle: Spaniard Ruben Moya (Kosmic), Adrien Renaudin (Sodi) from France, Greek Filippos Kalesis (Tony Kart), Belgian Yannick De Brabander (Praga) and Bradshaw (CRG). Race incidents eliminated Moya and Kalesis and Bradshaw sliced past Renaudin and De Brabander and set off in pursuit of Keirle and Nielsen. But the two leaders had opened up too big a gap and the Englishman was unable to catch them and had to be satisfied with third place. Nielsen kept Keirle behind him until the chequered flag winning in his new colours, those of Ralf Schumacher’s RS team. De Brabander finished fourth in front of Hebert. X30 Master: Morgan Riche’s stunning drive! 13th quickest, seventh after the heats and sixth in the pre-final, Morgan Riche (FA Kart) threw everything into his efforts to battle for outright victory among the over 30 year olds. The Frenchman got off to a great start in fourth place and made short work of Englishman Gary Turkington (Kosmic), and his fellow-countryman, Wilfrid Lecarpentier (Kosmic), and lap after lap he ate into the gap separating him from François Peurière (Tony Kart), who had dominated since the start of the weekend. On lap 9 (out of 21) Riche took the lead, and the guy who’s both driver and team manager of his own outfit, went on to score a magnificent international victory. Behind him, there were intense duels going on that led to many changes in the order. Irishman Raymie Eastwood (Tony Kart) managed to slip past his rivals, but fell back at the finish because of a detached spoiler. Frenchman Gérard Cavalloni (CRG) put on a strong final charge and snatched second place after starting thirteenth! Following him home were three other Frenchmen, Lecarpentier, Alexandre Leotta (KR) and Johan Renaux (CRG). 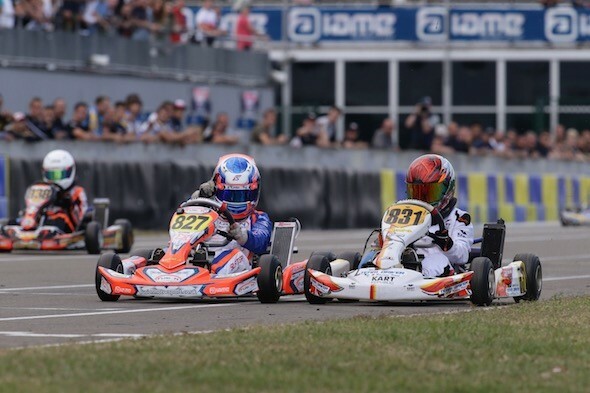 After hotly-contested qualifying heats between Swiss drivers Nicolas Rohrbasser (Kosmic) and Kevin Lüdi (Kosmic), Belgian Frédéric Op De Beeck (Formula K) and Briton Thomas Bale (Kosmic), the pieces of the puzzle gradually fell into place on Sunday. Due to race incidents Lüdi and Op De Beeck tumbled down the time sheets in the pre-final. Bale took the lead in the final and quickly confirmed his status as favourite. Rohrbasser tried all he knew but the Englishman soon opened up a big gap after an excellent start. Only Estonian Sten Dorian Piirimagi (Exprit) was able to match the searing pace of the leaders and the rest of the field was soon left several lengths behind. There were no changes in the final laps and Bale scored an uncontested victory from Rohrbasser, Piirimagi, Pole Prassetyo Hardja (Tony Kart) Christof Huibers (Gillard) from Belgium. X30 Mini: Crews snatches victory by seven-thousands–of-a-second! American Brent Crews (KR), the leader after the heats, had a really exciting Sunday. He lost three places in the pre-final while British driver William Macintyre (KR) won. The final got off to a chaotic start and this dropped him even further down the time sheets to 12th place on the first lap. At the front, Macintyre and his Fusion Motorsport team-mate, Freddie Slater (KR), were at it hammer and tongs. But lap after lap Crews fought his way back to the leaders like Italian, Juan Francisco Soldavini (Parolin). At the start of a crazy last lap Crews passed Slater at the end of the start/finish straight, but the latter got back in front after an incredible piece of late braking two corners from the finish. Crews fell back into his slipstream and then ducked out for the final tussle. The two drivers finished neck and neck with Crews beating Slater by the tiny margin of seven-thousands–of-a-second! Soldavini got the better of Macintyre for third place under the eyes of Spaniard Miguel Peiro Luzarraga (FA Kart), who rounded out the top 5. X30 Veteran: Franck Rouxel, winner for the third year on the bounce! Among the 466 drivers entered for the IAME International Final and the 70 in the X30 Master, 17 were part of the X30 Veteran category (45 years old and over). Unlike previous years none of them was able to reach the final in the Masters, further proof that the overall level of driving keeps on improving in this competition. Franck Rouxel at the wheel of his Sodi run by Ludo Racing dominated his rivals on the time sheets from Thursday to Sunday. 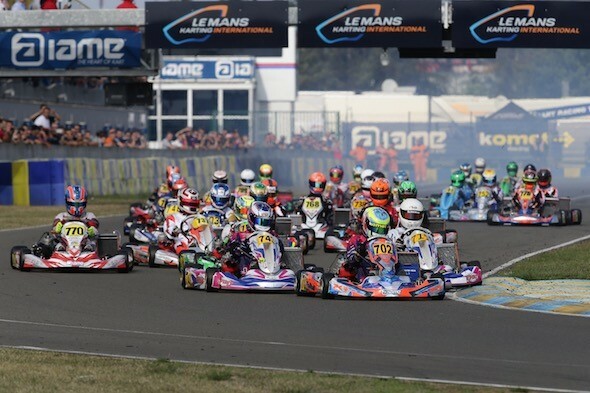 A minor incident in one heat dropped the Frenchman off the leader board and Spaniard, Mario Barros (Gillard), and two other French drivers, Willy Runget (Exprit) and Patrick Guidici (Kosmic), started to believe in their chances. 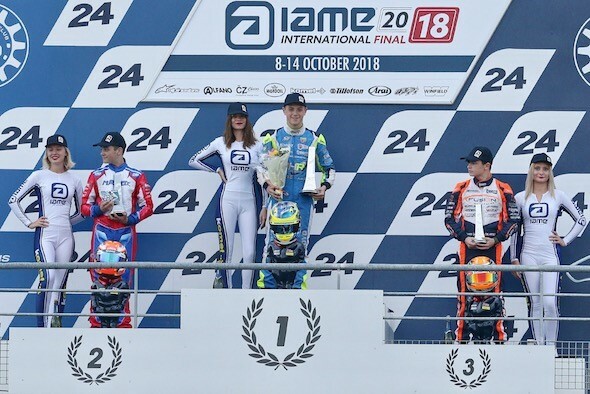 However, Rouxel hung on till the bitter end and won the 2018 IAME International Final adding another victory to those already scored in 2016 and 2017. His fellow-countrymen, Guidici and Franck Brive, completed the top 3.